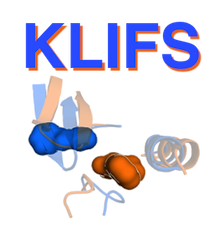 The new web-based version of KLIFS is now available! Go to http://klifs.vu-compmedchem.nl to access this new database via the new full-featured website. For the previous version of KLIFS see the details below. The Kinase-Ligand Interaction Fingerprints and Structure database (KLIFS) contains a consistent structural alignment and deconstruction of the kinase domains from over 1734 PDB structures covering 190 different human kinases. Every crystal structure was structurally aligned in a consistent manner, subsequently broken down from the full complex into separate structural parts: the protein, the orthosteric ligand-binding pocket (85 aligned residues covering the catalytic cleft), orthosteric and allosteric ligand(s), ions, organometallics, cofactors, and waters. By combining the pocket with the orthosteric ligand all interactions are annotated using Interactions FingerPrints (IFPs) for systematic comparison.